Calcium is a very important mineral that is essential to the human body. All body tissues need calcium. Calcium travels in the blood throughout the body. The parathyroid hormone helps regulate it. Bones and teeth contain 99% of calcium and tissues and extracellular liquid 1%. The main role of calcium in the human body is structural but it is also essential for muscle contraction, blood coagulation and cardiovascular and nerve function. Calcium is stored in the bones and released into the body as needed. The concentration of calcium in the body tends to decline with age, particularly in women, due to reduced estrogen levels. It also declines because it is released from the body through sweat, skin cells, and waste. Calcium absorption can vary depending on race, gender, and age. 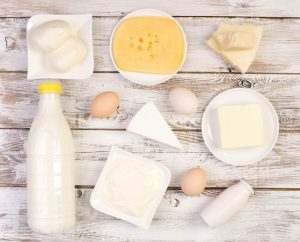 Calcium is found in milk and dairy products, yogurt, cheese, kefir, and eggs. Fatty fish, such as salmon) and especially fish whose bones can be eaten, also have high levels of calcium that can easily be absorbed by the body. Significant calcium levels are found in green vegetables, but unfortunately have lower absorption levels because of plant and oxalate salts. Vitamin D: Vitamin D helps the body absorb calcium. Milk, breakfast cereals and skin exposure to the sunlight for a few days a week, can provide all the vitamin D that a body needs to be healthy. Also salmon, mushrooms, sardines, tuna, liver, and egg yolks contain high levels of vitamin D.
Lactose: Lactose can increase calcium absorption. If you are not lactose intolerant prefer to drink milk and eat dairy products high in lactose. Meat and protein: If you eat moderate quantities of meat and protein you can help the body absorb calcium. On the contrary, a high protein diet, can result in a negative calcium balance, which could lead to bone loss. Caffeine and soft drinks: a high consumption of caffeine may increase bone density and calcium absorption. Oxalic acids: oxalic and plant acids can decrease calcium absorption. A high fibre diet increases calcium intake. Corticosteroids and epilepsy medications: These medications reduce calcium absorption and must be counteracted by increasing calcium consumption. Alcohol: avoid drinking more than 1-2 drinks per day. Low activity levels: people who exercise less, tend to have lower calcium levels and lower bone density than people who work out. Salt: salty food and high doses of sodium promote calcinuria. Excess dietary sodium may reduce bone mineral density. Try not to consume more than 2-4 grams a day through diet. Age: aging results in loss of bone density and difficulty in calcium absorption. Older people should increase their calcium consumption, avoid parameters that reduce absorption and increase parameters that increase absorption of calcium to be healthier.